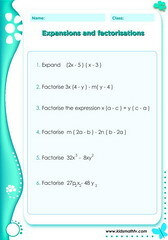 Expansions and factorizations worksheet for 7th grader kids to practice. Reviewing linear equations worksheet, solve these problems and plot lines on a graph. 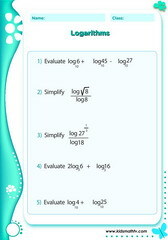 Logarithm expressions, pre - algebra worksheet. Solve equations requiring order of operations PEMDAS worksheet. using the Quadratic formula to find values of variables worksheet. Reviewing remainder theorem worksheet, pre - algebra skills for 7th grade. Making unknowns the subject of formula worksheet. Reviewing skills in financial arithmetic worksheet. Learn about simple and compound interests. 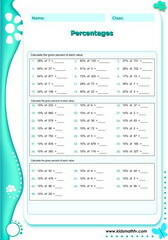 How to converting decimals to fractions worksheet for 7th grade kids. How to converting fractions to decimals worksheet e.g. 3/4 = ? in decimals. Converting percentages to decimals worksheet. For example 50 % = ___ in decimals. 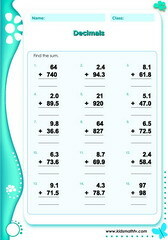 Addition of numbers containing decimals worksheet. Pay attention to place values. Division involving decimals worksheet for 7th graders. Multiplication of numbers involving decimals worksheet. Review math skills. Subtraction of large decimals numbers worksheet. 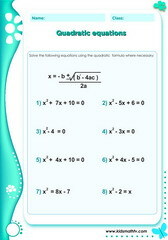 Learn Pr-algebra addition involving decimals and finding unknown variables worksheet. Pre algebra addition of decimals equations worksheet; finding missing values of 'x' or 'y'. Addition of decimal numbers with and without carrying across places worksheet. 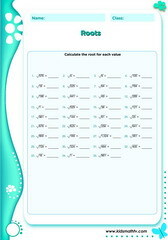 Learning adding of fractions worksheet e.g. 4/5 + 8/9 = ? Finding equivalent fractions, denominators and numerators worksheet. Fraction addition worksheet. First find LCM and then process to next steps. Multiplication of fractions worksheet e.g 6/7 x 4/5 = ? 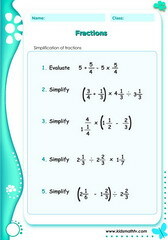 Simplification of fractions worksheet e.g. 25/75 = in lowest terms ? 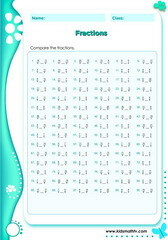 Subtraction involving two fractions worksheet e.g. 3/4 - 5/7 = ? Comparing Improper fractions worksheet, >, <, = e.g. 78/55 ___ 4/2. 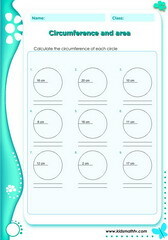 Finding the circumference and area of circles worksheet. Is the angle complementary or supplementary worksheet. Learn to different between types of angles. Finding the perimeter and area of L-shapes / complex figures worksheet. Finding the perimeter & area of squares worksheet. Area = L x w.
Finding the surface area of complex figures worksheet. Find the sum of all areas. 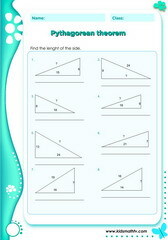 Find the perimeter and area of a triangle worksheet. perimeter = distance right round. 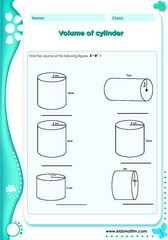 Find the volume of a cylinder worksheet. Solving linear inequalities worksheet. Gain skills in 7th grade algebra. Finding the absolute values of numbers worksheet. e.g. | - 50 | = ? Adding, dividing, multiplying integers worksheet. e.g. - 4 x 9 = ? 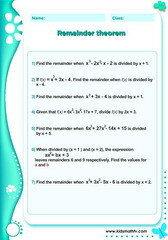 Addition of integers worksheet. Learn the rules of adding integers. Comparing big numbers worksheet for seventh graders. Solving equations containing integers worksheet. Ordering and classifying integers from small to big and vice versa worksheet. Practice converting millimeters to centimeters in this worksheet. Learn metric systems and converting scales with this worksheet. Converting between scales e.g. feet, inches etc worksheet. Finding number patterns with decimal numbers worksheet. Finding patterns among regular and decimal numbers worksheet. 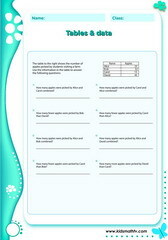 Mixed decimal number patterns worksheet. Find the trend of progression. Finding the next numbers in a mixed pattern worksheet. 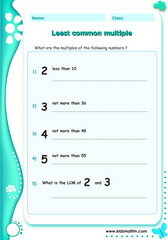 More activities on number patterns worksheet for kids. Find the next terms on number patterns with this worksheet. 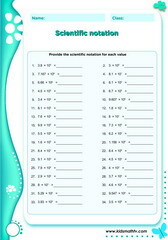 Find the Greatest common factor (or HCF) of two numbers worksheet. First find the factors. Finding the HCF of numbers worksheet. e.g. what is the HCF or 6 and 12 ? Finding the LCM of numbers worksheet. e.g. what is the LCM of 2 and 3 ? 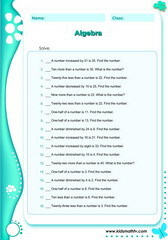 More on the number system worksheet. learn about numbers. Find the percentage of numbers worksheet. 45% of 56 = ? 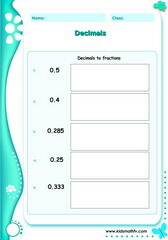 Converting between Ratios, percents, decimals & fractions worksheet. Expressing relationships as ratios worksheet. what is the ratio of 1 : 2 in relation to money etc. Raising numbers to powers or exponents worksheet. e.g. 10 to the 2nd power = ? Numbers raised to powers worksheet for extra practice. Expressing numbers in scientific notation worksheet. Finding the scientific notation of given numbers worksheet. 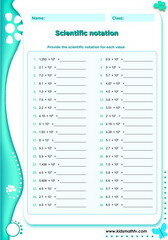 Understanding the concept of scientific notation worksheets. Finding the square roots of a number worksheet. e.g. the sq. root of 25 is ? Solving number problems with this worksheet. Pre algebra addition in which you find the unknown variable worksheet. 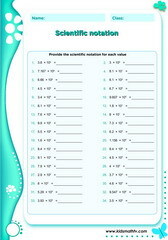 Find the value of variables through division of decimals worksheet. Multiplication & addition while finding variables worksheet. Subtraction and making unknowns the subject of the formula worksheet. Finding the possible outcomes and probability worksheet. Understand the notion of sets worksheet. 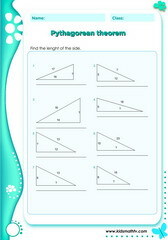 Find missing triangle sides using the Pythagorean theorem worksheet. 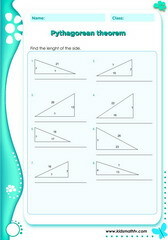 using the Pythagorean theory, find the side of right triangles worksheet. 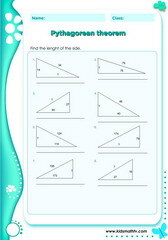 Learn to apply Pythagoras's theory with right angle triangles to fine missing sides worksheet. Find the hypotenuse of a right triangle using the Pythagorean theorem worksheet. 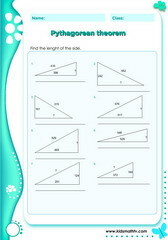 Applying the Pythagorean theorem in understanding how to find sides of traiangles worksheet. Math worksheet for kids to understand the concepts behind the Pythagorean theorem. Using the base and height of a right angled triangle, the Pythagorean theory can be used to find the sides. Covert percents into ratios worksheet. e.g what is 56 % in ratios ? 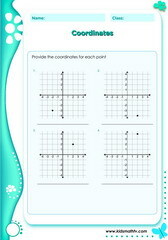 Coordinate geometry, finding the coordinate pairs of points on a graph worksheet. 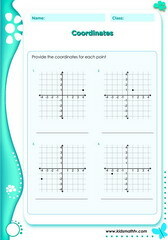 Coordinates graphs with points having an X Y pair, practice with this worksheet. Finding the coordinates of points worksheet. e.g find the point (2,3) .. Locating using coordinates worksheet. Start practicing in real life situations. Plot data on graphs worksheet for better visual understanding and quick interpretation. 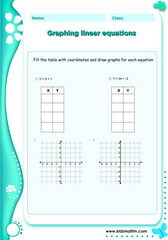 Graphing linear equations in algebra worksheet for 7th graders. Learn how to locate points on graphs in x y coordinate systems worksheet. Plot graphs and observe curves worksheet. Find out relationships. 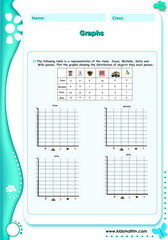 Represent data on tables and obtain information while solving math problems worksheet. Interpret information on tables with data from real life worksheet. 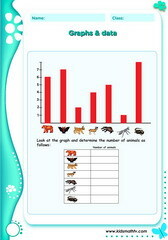 Worksheet to help kids understand how to interpret and use data from tables. 7th grade math worksheets to engage children on different topics like algebra, pre-algebra, quadratic equations, simultaneous equations, exponents, consumer math, logs, order of operations, factorization, coordinate graphs and more. Each worksheet is in PDF and hence can printed out for use in school or at home. This page simply spoils 7th grade teachers with extra resources for math tests and extra home work. It is also helpful for kids who need to prepare their final exams. What makes these worksheets easy to use is that each one contains an answer key for easy reference at the end of each exercise. Most sheets are free and you can share the links in your groups. Also remember to play some 7th grade math games online for more mental math solving.